Citra and Fuggles made their way to the Britannia pub in Northampton for thankfully the final time this season. We sampled the Black Sheep Best Bitter which actually tasted OK, although nice and clear it was as flat as a millpond. When we first started coming in here in the early part of the season the place was always fairly well used with punters, today there was about 4 of us, oh dear. Parker arrived at 4:10pm and we wended our way cross country to the delights of western Worcestershire and the metropolis of Redditch, needle capital of the solar system. It was just after 5:40pm when we entered the Black Tap brew pub. 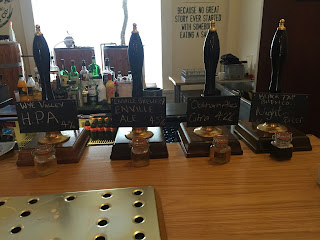 A decent selection of ales, Wye HPA, Enville’s Enville Ale, Oakham’s Citra and sadly just one of the house ales; Night Porter. Citra and Fuggles kick off with the Wye HPA (Hereford Pale Ale), we’ve supped this ale a couple of times already this season so we knew what to expect. It was in excellent condition, nice and clear with a good tight head, hanging on all the way down the glass. Citrusy, easy drinking session ale coming in at 4.0%, a very nice starter. Parker had his usual coffee, lovely. Next up, we went for Enville brewery’s Enville ale, 4.5% premium ale, golden with a slightly sweetish finish, honey springs to mind. Also in good nick, very clear with a good tight head. This time Parker tried half of the Black Tap Night Porter, dark, rich with a good dollop of black treacle, in very good condition, very clear and a good creamy tight head. Not the sort of ale we could drink all night but a good 4.5% porter none the less. Finally, Citra got his pint of Oakham Citra, he’d been hankering for a pint of this all night his favourite ale. Blonde mouthful of citrusy grapefruit, 4.2% with a slight haze but it tasted good. We'd cashed in our loyalty card so got one freebie pint, marvellous. That was it, time for the footy, no flickering lights this time, but with the kids’ footy taking place on the adjacent pitch, the car park was full. We just managed to sneak into a spot before the masses arrived. The pitch had a few dark patches here and there with the bottom corner well furrowed. The game, well we worked hard, huffed and puffed and probably had the best of the game. We completely battered them in the second half, but without a deep fat fryer, we never got the golden crispy finish, losing 2-1 with all goals coming from penalties. The needle match was sewn up in their favour; handbags were in evidence at the end of the game, Prada, Burberry, Primark. Time to go home, the PRATS were a bit mardy so that was if for today’s imbibing. We went through the 5000 miles mark this evening, with Dorchester this Saturday and one final trip to Sixfields Northampton to wrap up the season.